When you’re on vacation in Hawaii, it goes without saying you may want to indulge in some delicious cocktails, right? I mean, what’s an island vacation without drinks by the ocean?! Here, we’ve compiled a list of some of our favorite Hawaii cocktails, so you can order with pride at the bar! 1. Mai Tai: We put the most obvious cocktail first — the Mai Tai. Mai Tais typically have some combination of rum, Curacao liqueur, orageat syrup, and lime juice. “Maita’i” is actually the Tahitian word for “good.” And, it almost ALWAYS lives up to its name! You can find Mai Tais at just about any bar in Hawaii (if a bar doesn’t serve it here, be wary!). 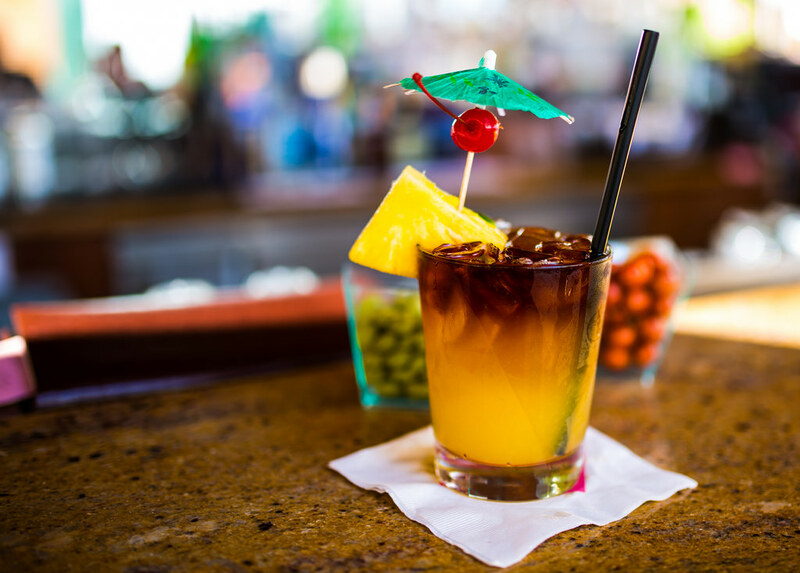 Mai Tai's are an all-time Hawaiian classic, found at almost every bar in the state. 3. Lava Lava: What do you get when you mix 1 oz. vodka,1 oz. Kahlua Coffee Liqueur, a dash of vanilla ice cream, and a half a banana? A Lava Lava cocktail! Oh, and it comes with a drizzle of Grenadine on whipped cream. If you hit a bar that doesn’t know how to make it, just give the bartender a list of these ingredients, and he/she will figure out the rest! 4. Hawaiian Margarita: This is a Margarita like no other! Just ask your bartender to blend 1.5 oz of Jose Cuervo Tequila, 1 oz of Lilikoi Concentrate, and 3 wedges of pineapple. Then, make sure he/she lines the rim with red li hing mui powder! 5. Haupia: Haupia is a coconut jello-like substance, so I was intrigued to learn more about this Haupia cocktail. Here’s what I learned: Take 1 1/4 oz. White Creme de Cacao, 1 1/4 oz. Malibu Rum, 1 oz. Coco Lopez Syrup, and 1 oz. smoothie mix, and blend it all together. Voila! You have a Haupia cocktail! 6. Lava Flow: Drinking a Lava Flow brings me back to my Pre-Mom days of sun and fun at some of the most beautiful resorts in Hawaii. I always had to make sure I didn’t drink one too close to dinner (they’re very filling), but I rarely left a resort without indulging in at least one. Basically, a Lava Flow is a mix of coconut rum, light rum, banana, pineapple juice, coconut cream, and frozen strawberries. This cocktail definitely gets my stamp of approval! 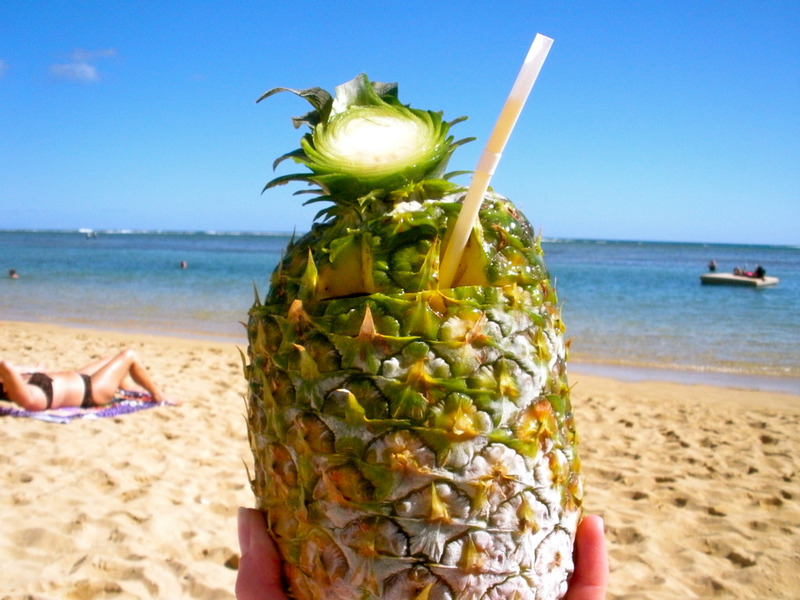 When in doubt, any alcoholic beverage that comes in a pineapple is a good Plan B. 7. Blue Hawaii: You can’t leave Hawaii without trying a Blue Hawaii — it’s one of Hawaii’s signature cocktails! Your bartender will know how to make one, but here’s the ingredient list: light rum, Curacao liqueur, pineapple juice, coconut cream, crushed ice. It’s all blended with a slice of pineapple and a maraschino cherry garnish. After a busy day of parasailing, snorkeling, or SCUBA diving in Hawaii, you deserve a cocktail to top-off your day! So, indulge in some or all of these Hawaii cocktails, and finally relax!